I am a park ranger, but still a visitor in this land. Today, I hike alone for an overnight stay in a place I think I know, one that still surprises me each time I visit. Camping permit in hand, I hoist my husky pack to escape busy parking lots with grand views to become one of a handful of distant ants moving across the landscape. In less than 10 minutes from the trailhead, each of us is alone on the trail. But this is deceptive: millions visit each year, each of us believing we are few. That's the magic of Haleakala National Park's wilderness, and a reminder that even park rangers should stay on the established trail so we create a passage only the wind remembers. I'm prepared for any weather condition, knowing that the high tropical mountain creates its own weather, day by day, moment to moment. The wind whispers a dozen different plans for the day, but only for one moment at one spot, and I cannot stand still. From an alpine desert that receives 30 inches of rain annually, I start my hike at 9,400 feet with only insects for companions. My goal is the cloud forest. Eight hours, 10 miles, and a drop of 3,000 feet later and the world will be primal Hawai`i. At Paliku, I'll be surrounded by forest birds and friendly geese landing for an evening graze amid red-blossomed trees dripping with mist. Even in summer, tent and raingear provide shelter through blistering sun or icy rain, both possible in the same day. Along the way a 360-degree view reveals lava flows, plants, animals, and sky — a scene that may have greeted a kamahele, a traveler, 2000 years ago. We can learn from the landscape as they did, and tell stories later. I pass by plants found nowhere else on Earth and practice the Hawaiian names of each volcanic cinder cone in my head, puzzling out the hidden meaning in each. 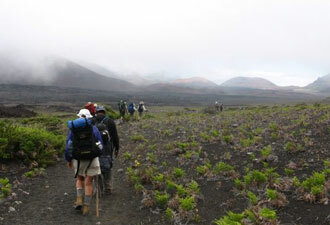 The next day’s march reverses the transition from rain forest back to cinder desert, then shrub forest again. That night at the Holua campground with tent secured against nightly winds, I anticipate a summer chorus almost as old as the volcano. The `u`au, the Hawaiian petrel, will return from daily ocean journeys spent fishing for squid, to climb the winds and burrow into the cliffs over the campground — 9,000 feet above and miles away from their ocean food source. 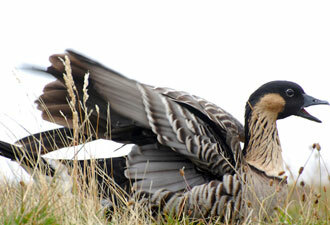 Each pair of these endangered birds shares a unique duet, sounding back and forth in darkness. Because the `u`au are extremely sensitive to light, my headlamp is off, and I'm happy to be an eavesdropper. By not shining lights or traveling off trail, I've become both protector and spy. Their lives go on without disturbance. I am careful to leave no food to attract unwanted animals to their habitat. Stars spin brightly through the night, and I am lulled to sleep. 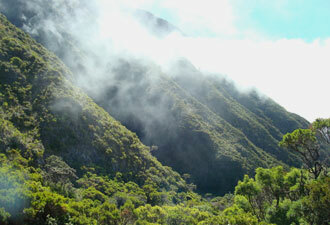 Hiking up steep Halemau`u trail, an owl hunting in daytime cruises past at eye level, both of us in the clouds. Leaving Haleakala's wilderness, I realize my journey was not alone, but shared with all the plants and animals unique to the park. I re-traced the paths of ancients as well as those of modern conservationists working to preserve this piece of Hawaii. My steps follow all of theirs, but the journey is new to me. If I've done my part no one can tell I came this way. Wilderness discovery is a huge draw, but not the only option, for visitors to Haleakala National Park. You'll find a variety of park programs offered every day including, guided hikes, Junior Ranger activities for kids, bird watching, and front-country camping. Whatever your pleasure, take time out to enjoy — prepare for more than one moment, listen to the wind, watch the stars, and drink the rain.